Mae’s funeral service will be 1:30 p.m., Saturday, March 23rd at the funeral home. The service will be conducted by Pastor Aaron Gunsaulus of the Christian Reformed Church in Newton. The family will greet friends from 5-7 p.m., Friday, March 22nd at the funeral home. Burial will be at the Restland Cemetery in Baxter. In lieu of flowers the family requests memorials to the Newton Christian Reformed Church. Memorials may be left at the Wallace Family Funeral Home & Crematory in Newton. If you are mailing the memorial to the funeral home, please add, Attn: Norvell Family on the envelope. Anna Mae Swank Norvell, the daughter of Pete and Ella Van Niewenhuis Swank was born on December 25, 1931 in Lynnville, Iowa. Mae and her family moved to Newton, Iowa and she was a graduate of Newton High School. On February 19, 1949, Mae was united in marriage with Willard Gene Norvell at the Little Brown Church in the Vale in Nashua, Iowa. She was a homemaker. Mae was a member of the Newton Christian Reformed Church in Newton and the Mary and Martha Society. She loved being surrounded by her family. She also enjoyed antiques and being out in her yard, enjoying the birds, squirrels and flowers. 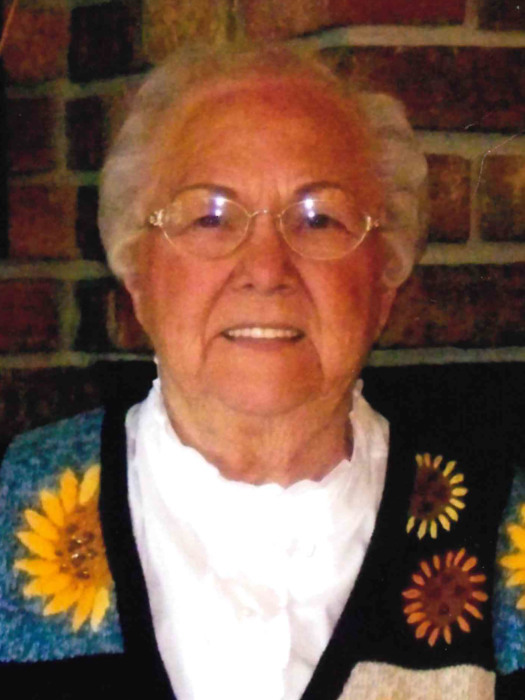 Mae went to be with her Lord on Wednesday, March 20, 2019, at MercyOne Des Moines Medical Center in Des Moines. She was 87. She was preceded in death by her parents, husband, Willard; daughter, Billie Jean Warner; brothers, Pete Swank and Jim Swank; and sisters, Margaret Wearmouth and Louise McKinney. Those left to cherish Mae’s memory are her sons, David B. (Marcia) Norvell of Largo, Florida and Chris (Jennifer “Jen”) Norvell of Newton; five grandchildren, Jordan Norvell, Allie Norvell, Myzsaa Norvell, Michael Wells and Jennifer Wells; two great-grandchildren, Misa Wells and Jacob Showalter; her brother, Fred Swank of Newton; her sister, Barbara Hartgers of Newton; and many nieces and nephews.